We kayaked Lake Potanipo in Brookline last Sunday and also took the suggestion of Andrea (a fellow kayaker and commenter here) to visit nearby Andres Institute of Art. It was a very pleasant afternoon, thanks to some of the best summer weather we've had all season. If I'm being honest (and you DO want me to be honest, right? ), I would recommend both the lake and the Institute if you're in the area. I'm not sure I would drive a long distance to get here. I hope my reasons for saying that will become obvious as you read on. First off, there's a chapter on Lake Potanipo in my book, Exploring Southern New Hampshire. Despite my best effort, I made some factual errors in the book about the lake and I'm hoping this blog post will help to set the record straight. The most important point is that there is an easy access boat launch open to the general public all season. My book says it's only open to town residents in season and out-of-towners during the off-season. Oops! Secondly, we had kayaked this 136-acre lake about five years ago and I recalled one shore of the lake being crammed with summer homes. I didn't get the same crowded feel this time around, possibly because the trees have grown up and are shielding the view of the houses dotting the shore. So what can you expect to find here? An easy-access lake, a Jewish kids' camp near the town beach and some power boats. There's no reason folks who own lakefront property should be prohibited from tubing and all those fun things...we just prefer not to deal with their sometimes erratic driving and the wake they create. In reality, there were only two boats out the day we were there, but on a small lake it makes a difference. Before too long, the channel was blocked by downed trees (a beaver dam?) so we couldn't go too far. But we're told that some people carry their boats over the dams and keep on going, especially when the water is higher in spring. Something to think about if you are exploring here earlier in the season. In the end, we spent an enjoyable two hours on the water. And just for the record, the history about the lake included in the book is accurate. Potanipo was once the site of the "largest icehouse in the world." The Fresh Pond Ice Company came here from Somerville, Massachusetts in 1890, after their water source in Somerville became a town reservoir. There were only about 540 residents in Brookline at the time. The Company not only brought 300 jobs, but also brought the railroad to this sleepy little corner of New Hampshire. There's more to the story...but I'd love you to get your hands on the book to read about it. Next, we headed to the Andres Institute of Art, an outdoor sculpture park with walking/mountain biking trails, located off Route 13 in Brookline. After two hours of kayaking we didn't spend a lot of time here, but we did walk about one mile of trails. I had been forewarned that we should expect a bit of an uphill hike to see the sculptures -- thanks, Andrea...you were right! Let me also add that the trail maps and signs are quite confusing. Neither one of us could really make much sense of them. Anyway, each year the Andres Institute invites sculptors from around the world to create permanent installations on the 140-acre site. This year's symposium (coming soon) will bring artists from Bangladesh, Germany, Zimbabwe and Texas. I'm not an art critic and certainly didn't love everything we saw in the park, but I do appreciate the mix of art and nature. I also appreciate that the artists are working with some difficult materials (huge stones in some cases) or found objects, in other cases. My husband Doug enjoyed the walk and said he'd like to come back another day...so that's an endorsement from someone who's usually tough to impress. 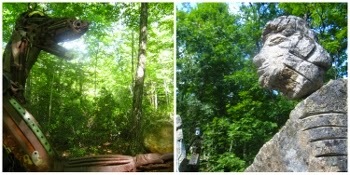 For now, I'll leave you with a couple photos of the sculptures we saw. Footnote on the Lake: I just read there's a channel to the far left side of the boat launch. We headed right. Are there two channels? If you're familiar with Potanipo, please write in and set me straight. Directions to Lake Potanipo: Take Route 101W (toward Keene/Peterborough) to Rte. 13 south toward Brookline. After several miles, turn right at the blinking light onto Mason Road. The put-in is almost immediately on your right and is well-marked. Directions to Andres Institute: It's best if you GPS the address - 98 NH 13, Brookline NH. We had a little trouble finding it, but it's on the west side of Route 13. Look for a "low to the ground" stone sign. Drive in a couple hundred feet to the parking area. There is no admission fee.